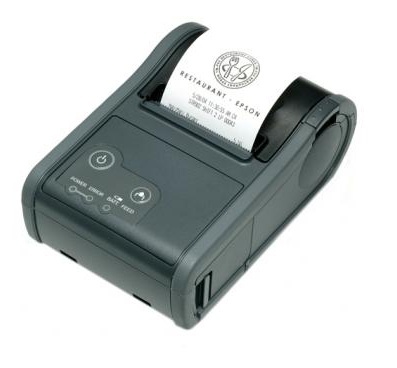 The TM-P60 is a mobile thermal receipt printer. Its comfortable, single-handed handling at the belt belt-clip included and its long battery life for printing up to 250 receipts make it the ideal partner for hospitality and other mobile applications. Like all thermal receipt printers, the TM-P60 also delivers an exceptional print quality. It prints at up to 70 mm per second and neatly cuts receipts by means of the integrated automatic receipt cutter. Thats why there are never waiting periods or delays while collecting cash. In operation, the TM-P60 proves itself additionally through its robustness. It survives falls from heights of up to 120 cm undamaged and withstands spray water as well as dust. With the optional rapid charging device, discharged devices are recharged in approximatley two hours. Paper and accumulator replacement is carried out in a few single-handed movements. The communication by means of the ESC/POS commands ensures compatibility with all current POS systems and radio terminals. The interfaces facilitate integration into already existing systems. The printer has a Bluetooth as well as of a serial interface.